The beef carcass has 13 pairs of ribs, but not all of the ribs are included in the rib primal cut. The first 5 ribs are part of the chuck cut in the front of the animal. The 13th rib is part of the loin. The rib primal contains ribs 6 through 12. A short rib refers to a small piece that has been trimmed from the main portion of a rib when the rib cage is trimmed into smaller cuts. Short ribs are cut from the chuck and plate primals and back ribs are from the rib primal. Short ribs cut parallel to the bone are known as English style short ribs. They may include a bit of the bone or may be sold boneless. Short ribs that are cut across the rib bones are known as flanken. Ribs 1 through 5 are located in the chuck primal. They have plenty of meat and have less fat than short ribs from the plate. 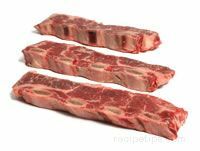 English style short ribs are cut parallel to the bone and flanken style short ribs are cut across the bone. The ends of the 6th through the 12th ribs are contained within the plate primal cut. The plate short ribs are usually taken from the flat ends of ribs 6 through 9 and are cut only a few inches long. The ends of ribs 10 through 12 have more fat than meat. Back ribs are the portion remaining after a rib roast is boned. The full back ribs are long and do not have a lot of meat, but they are tender and tasty when grilled.